This article was written by Lindsey Rogers. Argentina has had a long and complicated history. From colonialism to the Peron era, Argentina has been through it all. One of the most shocking and tragic times in its history is the military dictatorship, which lasted from 1976 to 1983. This time is known as the Dirty War in the US, but in Argentina, this time is known simply as the dictatorship or genocide. Calling it a war is has a negative connotation to those who were personally affected by the event. During this time, basic human rights were violated and 30,000 people were kidnapped, tortured, killed, and disappeared. March 24, 2019, marked 43 years after the genocide. In Argentina, March 24th is Memorial Day for Truth and Justice, marking the day of the coup against Isabel Perón. 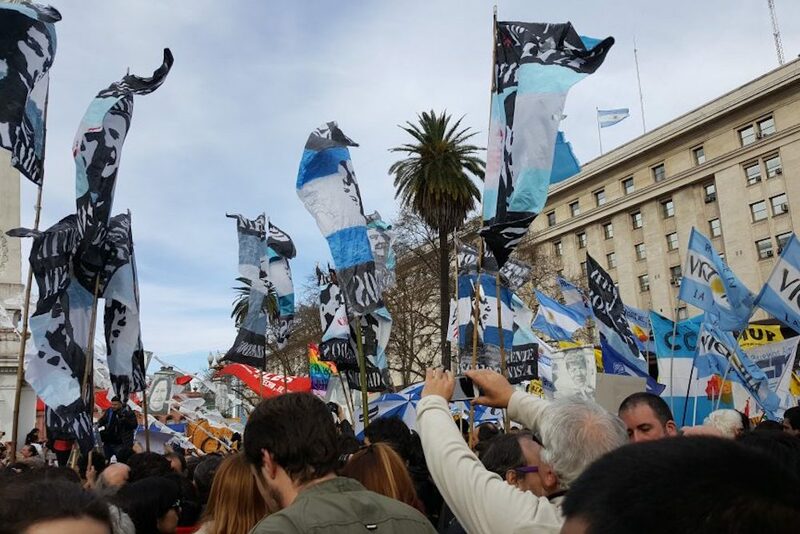 To remember those who were lost, the Argentine people held a large march in the infamous Plaza de Mayo to honor the disappeared and teach future generations about what had happened. This march happens every year and was originally started by the Madres de Plaza de Mayo. Memorial Day is also a day off work and school for the country. After Juan Perón passed away in 1974, his wife, Isabel Perón took over the presidency. Peron’s former wife, and more popular wife, Evita, had passed away in 1952. However, Isabel did not have as much political success as her husband. The Peronist political party was constantly splitting and moving, making it difficult for the country to unite behind a single leader. In 1976, a group of military personnel, known as the junta, took over. This military dictatorship began picking away at what the Perons had built. The dictatorship began what they called the National Process of Reorganization where the government used state terror to control the political opinions of the citizens. During the military dictatorship, there were many violations of human rights of many groups of people. The dictatorship targeted politically active people, especially the youth and professors, to keep control over the people. If the military dictatorship thought that a person or a group of people was a threat to their political ideology, they would be robbed from their houses in the middle of the night and sent to concentration camps to be tortured and killed. While not officially classified as a genocide by the United Nations, the people of Argentina insist it was because of the sheer number of people that were killed based on political discrimination. 30,000 people were robbed of their lives. 30,000 people were not able to live their lives solely based on their perceived threat to a cruel dictatorship. The military dictatorship linked Peronists with Marxists. In order to contain communism/Marxism and promote capitalism, the United States had a heavy hand in the Dirty War. The United States had oversight in the dictatorship in Argentina, meaning the United States must have known what was going on, but in the name of containing communism, the disappearances continued. To this day, it is unclear exactly how much the United States government knows. Argentines are skeptical over the role of the United States intervening in other countries. The military dictatorship officially ended in 1983 with the election of Raul Alfonsín. The start of the official fall of the regime began in 1982 when the government attempted to regain popular support by going to war against Great Britain over the Falkland Islands, known as the Malvinas in Argentina. This war ended in Argentine defeat and almost immediately after the war stopped, democracy was restored to the country. The country was left in a state of pain with the recent terror that was in the country. The people wanted answers. Alfonsín then created the National Commission for the Disappeared Persons (CONADEP) to investigate what happened and remember those who were lost. Another main objective of the organization, as well as similar organizations, was to identify who was taken. This includes creating large archives with all of the photos and names of the people. Today in Argentina, the idea of memory is extremely important, especially in schools and universities. The fight for memory represents a fight for human rights and political freedom. In 1977, a group of mothers searching for their missing children organized and created Madres de Plaza de Mayo. What started out as a small group of 14 mothers looking for their children grew into the large organization that it is known as today. During this same time, the grandmothers also created their own group called Abuelos de Plaza de Mayo. These two groups are still prevalent in Argentine society today and are active in fighting for human rights justice. Later, in 1995, the children of the disappeared were old enough to create their own group that advocates for the justice of their parents. This group is called HIJOS and they too are still prevalent in Argentina today. All of these groups, and many more, were at the march for memory. Today, the memory of the disappeared is everywhere in the streets of Buenos Aires and La Plata, the capital of the Providence of Buenos Aires. The graffiti on the walls of buildings remembers those disappeared. In the center of La Plata, a map of the city is painted on the sidewalk with every location someone disappeared marked. Memorial bricks are painted in the actual places where someone was taken. These memorials serve a very important purpose. Firstly, they honor the lives lost, but they also teach people about what happened and what could happen again if the citizens are not watching what happens in the political sphere. The annual march in Buenos Aires represents the unity of the people that this tragedy will never happen again. 43 years later, the people are still fighting for the citizens and neighbors they lost. With the strong memories of the dictatorship in their heads, the people can fight for the correction of the violations of human rights for the future. Memorial Day not only represents sadness for what happened, but the hope of the future to come.